City lot on west side of building. Hamptons is happy to arrange for Limo or taxi service with prior notice. There’s always something special going on at Hamptons. Hamptons is now serving brunch! Seal the Deal or Celebrate in Style. 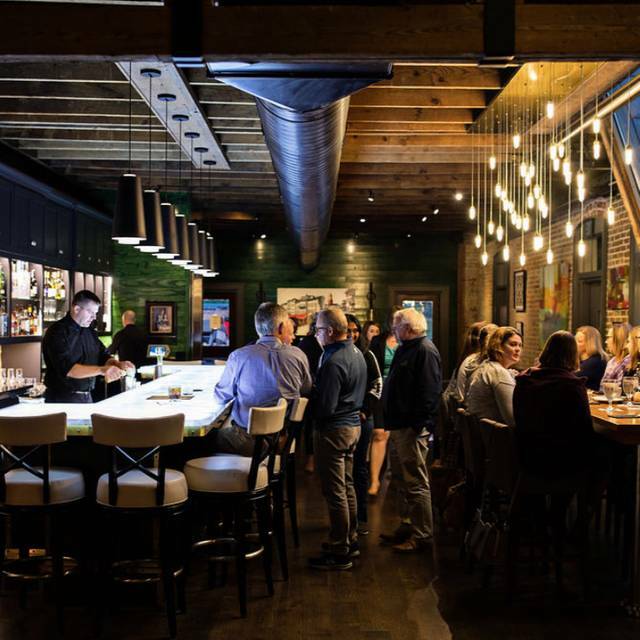 Hamptons can accommodate up to 120 guests for private functions in our Main Room off premise events to 600. Ideal for business or social gatherings, with the ability to offer special services for any private or corporate event, including wine tastings and seminars, audio-visual presentations, and more..
Hamptons can accommodate up to 120 guests for private functions. Ideal for business or social gatherings, with the ability to offer special services for any private or corporate event, including wine tastings and seminars, audio-visual presentations, and more.. Featuring Regional American Cuisine with an Italian accent, all in a unique and inviting atmosphere. 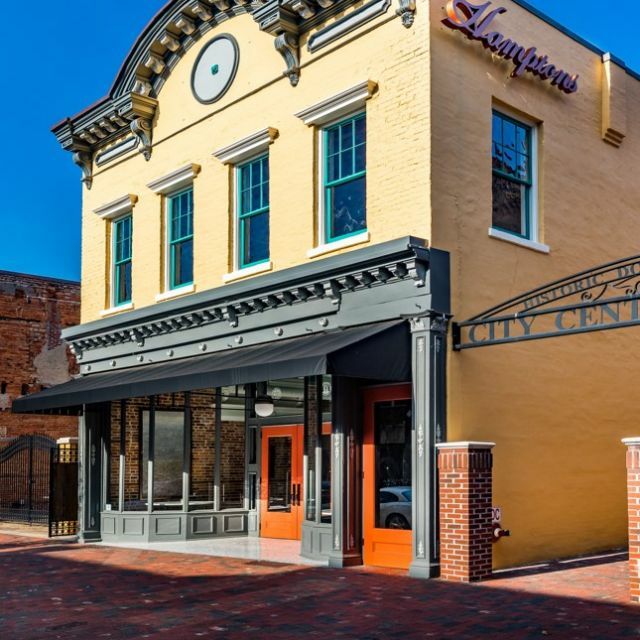 Located in the heart of South Carolina in the beautifully restored historic downtown setting of Sumter. Hamptons provides an ideal destination for top shelf business luncheons or relaxation and entertainment. When you seek an exceptional dining experience for holiday parties, supper clubs, dinner parties and luncheons, Hamptons is the destination of choice. Let us tell you more about what we can provide. Had brunch with family. Everyone loved their meal from the bread to the main course. Highly recommend! Dinner at Hamptons never dissappoints. My business associate was very impressed that we had such a great restaurant in our small town. I would like to say that Alex and Kim are outstanding and I would go out of my way to request them if you have dinner at Hamptons. While the food at Hamptons is elegantly fabulous, the service is equally executed well. Alex and Kim make sure that everything is just right. They pay attention to every detail and attend to each dining guest perfectly. While I dine out frequently at nice restaurants throughout our state, I do not normally write reviews, but Hamptons is worth my time to make a few comments about. I am thankful to the owners and managing team for being in Sumter and for assembling such an excellent staff. May the folks at Hamptons have many years of great success. May God Bless everyone at Hamptons! We chose Hampton’s for a date night while our boys were with our parents. We had heard good things and were looking for something a little more upscale than Sumter’s usual fare. Definitely impressed with the service, quality of food, and overall ambiance. We will be back! Hampton’s rooftop bar is amazing and a great place to meet friends. Dinner at Hamptons was good but not great. Service is slow... very slow. Menu has changed since our last trip to Hamptons and is now more Italian themed. To drive an hour for dinner, the restaurant must deliver great service, food and wine. I am afraid we won’t make that trip again anytime soon. Food and service excellent as usual. So nice to such fine dinning in Sumter we will be back soon. I truly enjoy Hamptons. Their attention to the fine details is evident throughout the adventure of dining there. The food is an absolutely delightful work of art. Always a very special experience, I often try to create a "new special occasion" so we can come back. I Love it, I really do. Our 5th visit to the Hamptons, & the first at the new location. It took almost an hour to receive our food, & no bread was offered to the table. Wait staff kept dropping flatware sound us which we found entertaining, & a goblet which landed on a chair next to us. Entertainment aside, we considered the food mediocre at best, & the whole experience a disappointment to our guests. Hampton’s seems very overrated lately, unfortunately. It had been several years since we visited Sumter and ate here. Now in a new location Hamptons was just as wonderful an experience as we remembered. We split four courses with signature cocktails, a bottle of recommended wine and each had dessert. Wonderful fresh, perfectly seasoned courses with excellent, attentive service. We will become regulars when in Sumter. If you are an out of town foodie visiting Sumter, Hamptons is a must! Prom date! Very special memory. Forgot wrist corsage at the table but the staff found it and kept it for me. Great waitstaff and attentive service. The food was amazing! Fabulous gem in historic downtown Sumter, S.
Carolina! The chef is awesome & all the staff were great! Wonderful as always. We always enjoy the food and atmosphere. Thank you Hamptons! The food was great. The music was right. The wine was super, but Alex was exceptional!!! Service is always great. Enjoyed having brunch outside, the food never disappoints! Fresh ingredients and perfect portions! Enjoyed the outdoor seating for brunch and the salmon and grits were delicious. And my husband very much enjoyed his omelette. We look forward to returning to Sumter and the Hamptons. Very good overall. We will be going back. Nice atmosphere, very quiet, very good food. Excellent, as always! Our server was perfectly attentive without being annoying & very personable. We had a perfect night celebrating a birthday! Anniversary dinner was marvelous!! Hampton’s is our “go to” place for just about every occasion. Some good friends came from out of state and we brought them to Hamptons. They were blown away by the menu & ambiance. The food was some of the best we ever had & our server made us feel welcome & she made sure we had everything we didn’t know we needed! Headed up to Rafters upstairs bar after dinner & just when we thought things couldn’t get better they did. Had craft cocktails on the roof top patio & ate dessert next to the fire. All magical, all night. I haven’t had better food anywhere! The pork belly & Italian ricotta gnudi our server suggested was delicious. Gorgeous restaurant & outstanding service. Will be back! the food is always great! i also love the decor. the wait staff seemed unorganized and stressed and we waited over an hour to be given the chance to order our food. i had guests from out of town who may not revisit due to the very long wait to even order. no empathy or explanation was offered by wait staff serving our table. customer service could be better. Great food and wonderful service! 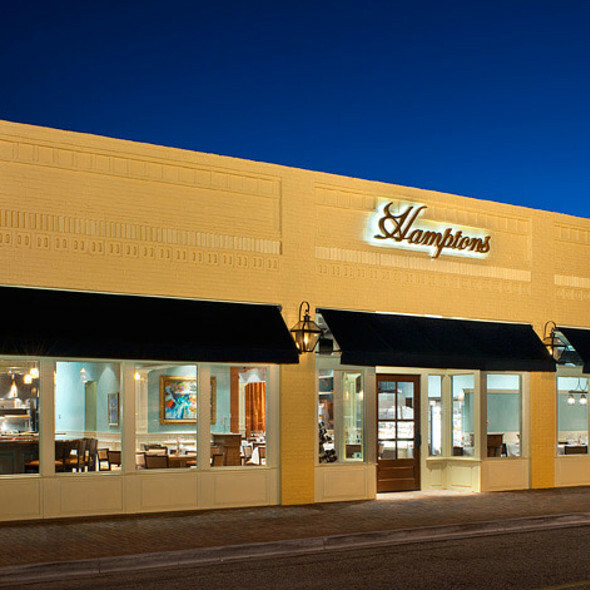 We love having dinner at Hamptons! The food and service were amazing. This was our first time visiting the new location and it was still a memorable experience. Service staff rivals the best I’ve ever had. She went through the menu with us & sold us on perfect starters, entrees & wine to pair. Can’t wait to come back to this hidden gem. The service was impeccable, the food delicious and more than I could finish, although there was still room for warm pecan cake with ice cream. Our waiter checked on us frequently but was not at all intrusive. We had an excellent evening. As always, the brunch was delicious. My daughter from California loves the decor and wants to be sure to dine there again next time she visits. This restaurant is on the top ten list of Sumter eateries for good reason. The decor was stunning. The wait staff very attentive and the food was delicious. I had the crab quiche and it was the best quiche I have ever tasted. Food was amazing and Caleb, our server, was very professional and friendly. We will definitely be back! Wonderful atmosphere, service, and excellent food every time we go. Love the recent changes to the menu, which was already wonderful. The Pork Belly, first course, may be the best pork belly I've ever had anywhere. Overall was okay. Nothing spectacular. I was disappointed there wasn’t a filet on the menu. The food was perfect, our waitress was fantastic, and the restaurant is beautifully decorated. Truly a fine dining gem in downtown Sumter. Very good food, well worth the 40 mile drive!